Patrick McGilligan is well known to film enthusiasts as the author of the much-admired, and a finalist for the Edgar Allan Poe Award in 2003, “Alfred Hitchcock: A Life in Darkness and Light.” Other celebrated works include “Fritz Lang: The Nature of the Beast,” and “Cukor: A Double Life,” both New York Times Notable Books. Patrick’s other books include “Clint Eastwood: The Life and Legend,” “Jack’s Life: A Biography of Jack Nicholson,” “Robert Altman: Jumping Off the Cliff,” “Tender Comrades, A Backstory of the Hollywood Blacklist” (coauthor) and most recently, “Oscar Micheaux, The Great and Only: The Life of America’s First Black Filmmaker. ” His latest book is “Nicholas Ray: The Glorious Failure of an American Director.” Mr. McGilligan lives and works in Milwaukee, Wisconsin. 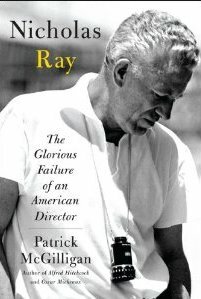 Why the title “The Glorious Failure of an American Director?” I mentioned I was reading your book to a fellow film enthusiast and I felt he left with the impression you saw Ray’s entire career as a failure, which I know you don’t. IT’S A DELIBERATELY PROVOCATIVE TITLE WITH SEVERAL MEANINGS, LIKE OTHER TITLES OF MINE – LIKE “ROBERT ALTMAN: JUMPING OFF THE CLIFF” (SIMILAR INFERENCE, SUGGESTING ALTMAN COURTS COMMERCIAL SUICIDE BY HIS ARTISTIC STRIVING) OR “FRITZ LANG: THE NATURE OF THE BEAST.” THE LITERAL MEANING OF A TITLE IS THE LEAST INTERESTING OR RELEVANT FROM MY POINT OF VIEW. 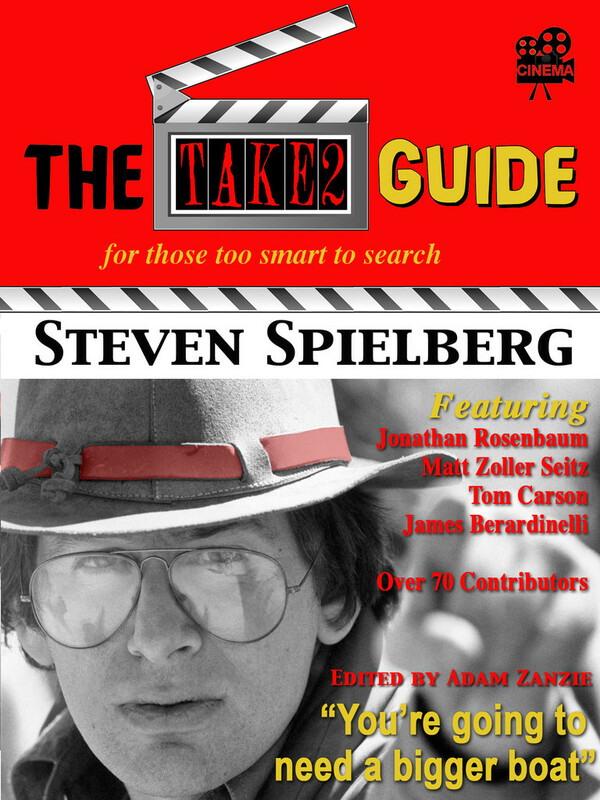 FOR ONE THING, IN THE CASE OF THE RAY BOOK, HIS FILMS OFTEN CONCERN PROTAGONISTS (EVEN JAMES DEAN IN “REBEL WITHOUT A CAUSE”) WHO ARE PREOCCUPIED WITH THE QUEST TOWARDS SOME IMPOSSIBLE GOAL. THEY OFTEN ‘FAIL.’ THEIR GLORY LIES IN TRYING, NOT SUCCEEDING. AND WHAT ABOUT IRONY IN A TITLE? “What could have been,” seems to be a thorn that hangs over Nicholas Ray’s life and work, a man full of dreams, drive, talent, along with many opportunities to make all it come true. His film career seems to have been torn between the struggle of being an artist, a rebel, an anti-Hollywood type filmmaker and the seduction of the glamour, the deal making and the money that Hollywood offered. I’M NOT SURE WHAT YOUR QUESTION IS HERE. THAT IS ONE WAY OF LOOKING AT IT, WHAT YOU HAVE SAID. HOWEVER, YOU COULD ALSO SAY HE HAD A MAGNIFICENT CAREER. A BLIGHTED CAREER, TRUE, BUT I REMEMBER WHAT JULIUS J. EPSTEIN TOLD ME WHEN I ASKED HIM HOW MANY FILMS HE HAD WRITTEN THAT HE WAS TRULY PROUD OF. MAYBE THREE OR FOUR IN FORTY YEARS, HE SAID. I WAS ASTONISHED. YEAH, HE SAID, BUT A HANDFUL IS A LOT IN HOLLYWOOD. SO YES, IT WAS A STRUGGLE FOR RAY TO PROVE HIMSELF A REBEL AND AN ARTIST, AND HE DIDN’T ALWAYS SUCCEED AT THAT LOFTY GOAL, BUT HE WOULD AGREE WITH ME THAT HE DIRECTED A HANDFUL HE COULD BE TRULY, DEEPLY PROUD OF. Many of Ray’s characters in his films have a strong sense of loneliness, alienation, being an outsider, Robert Ryan’s cop in “On Dangerous Ground,” the three teens in “Rebel Without a Cause”, Bowie in “They Live by Night.” These appear to be the kind of characters Ray was most attracted to and identified with. WITHOUT A DOUBT FROM YOUTH RAY REGARDED HIMSELF AS AN OUTSIDER OR REBEL AND IDENTIFIED WITH THOSE KINDS OF PEOPLE IN HIS FILMS AS WELL AS IN REALITY. SOME FILMS CONTRADICT THIS THEME (LIKE “FLYING LEATHERNECKS”) AND SO DO SOME PROFESSIONAL RELATIONSHIPS (LIKE HIS CLOSE ONE WITH HOWARD HUGHES). BUT IN GENERAL THIS REMAINED A CONSTANT IN HIS WORK AND LIFE. IT WAS A VERY CONSCIOUS IMPULSE WITH HIM, WIELDED AS PART OF HIS PUBLICITY AND IMAGE ALSO. One of Ray’s talents that shown itself early was his ability to interact with people, social networking, pre-FaceBook. He was a great networker, resulting in him having quite a few famous mentors early in his life, Thornton Wilder, Frank Lloyd Wright, John Houseman and Elia Kazan among others, all who seemed to have left an imprint that would reflect in Ray’s later life as a filmmaker. INDEED RAY WAS CLEVER ABOUT HOW HE SOCIALLY NETWORKED WITH PROMINENT PEOPLE AND I TRY TO POINT OUT HOW HE ‘WORKED’ CONTACTS LIKE WILDER, WRIGHT, AND HOUSEMAN . HE WORKED VERY HARD ON THOSE KEY RELATIONSHIPS. ALAN LOMAX WAS ANOTHER. HOWEVER, KAZAN WAS THE GREATEST MENTOR AND INFLUENCE, AND CAST THE GREATEST SHADOW OVER RAY’S CAREER, INFLUENCING RAY’S IDEAS ABOUT THEATRE AND FILM (AND POLITICS). KAZAN WAS AWARE AND SOMETIMES UNCOMFORTABLE THAT RAY IDOLIZED HIM, AS HIS CONTEMPORARY LETTERS SHOW, BUT THAT MAY BE WHY THEIR RELATIONSHIP WAS THE LONGEST AND CLOSEST OF THOSE MENTIONED. A major period in Ray’s life was when he began to work for the WPA archiving folk art for the Library of Congress, working with Alan Lomax and meeting artists like Huddie Ledbetter, Woody Guthrie, Josh White and Pete Seeger and most importantly John Houseman. This must have been a fascinating period. THIS PERIOD FORMED HIM AS MUCH AS HIS THEATER EXPERIENCE. HE LEARNED AND BORROWED FROM LOMAX AND HOUSEMAN. HE NEVER LOST THE IDEA OF HIMSELF AS A POPULIST, A MAN OF THE PEOPLE. THE BACKGROUND OF THE WPA AND MUSIC AND CABARET AND RADIO BECAME IMPORTANT, LATER, TO HIS FILMS. 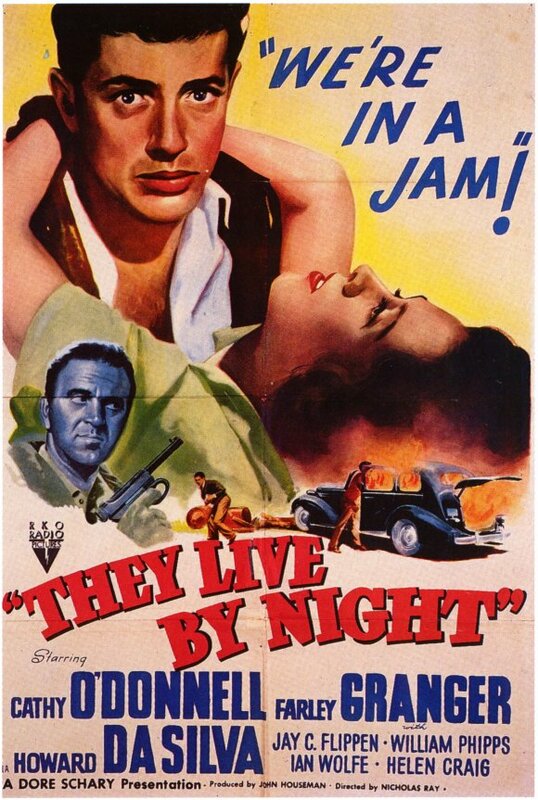 All of Ray’s previous experiences in theater, radio, architecture, working for the WPA seemed to have prepared him for when he finally made his first film, “They Live by Night.” It’s a masterful directing debut; right from that opening aerial shot he displayed an appetite for visual flair and not doing the standard shots. I think it remains one of the great film debuts of all time. I REMIND PEOPLE IN MY BOOK THAT ”THE LIVE BY NIGHT” WAS THE FILM RAY HAD THE LONGEST TIME TO PREPARE. HOUSEMAN WAS A GODSEND AS A PRODUCER AND RKO AT THAT TIME WAS SUPPORTIVE OF ALL OF RAY’S INNOVATIONS, FROM CASTING TO AERIAL SHOTS. IT IS THE SCRIPT HE HAD THE LONGEST TIME TO WRITE, THE ONE THAT IS MOST ‘HIS’ SCENE BY SCENE. EVEN ‘REBEL’ IS MORE INDEBTED TO STEWART STERN THAN ‘THEY LIVE BY NIGHT’ IS TO THE SALVAGE WRITER, CHARLES SCHNEE – WHO WAS ALSO VITAL TO THE FILM’S QUALITY. IT IS THE FILM RAY HAD THE MOST FREEDOM TO MAKE, BEFORE HUAC, ANTI-TRUST RULINGS AND TELEVISION CAME ALONG TO MAKE TROUBLE FOR HOLLYWOOD (AND HIM). WITH ‘REBEL WITHOUT A CAUSE,’ IT IS THE PUREST NICK RAY FILM, THE LEAST COMPROMISED, FROM BEGINNING TO END, BY ANYTHING OTHER THAN HIS OWN DECISIONMAKING. 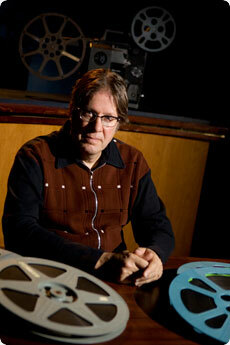 From the beginning, Ray was torn between being a player in Hollywood who compromised and the more adventurous personal filmmaker he desired to be. He appeared to compromise himself with his next two films (A Woman’s Secret and Knock on Any Door). You describe in detail how the source for “Knock on Any Door, ” a hard hitting gritty novel, was soften to appease the Production Code and to continually enlarge Humphrey Bogart’s role, which was hardly even in the novel, and Ray seemed to just accept it all without much of a fight. I BELIEVE BOTH OF THE FILMS YOU MENTION WERE HURT AS MUCH BY HUAC AS BY THE PRODUCTION CODE, ALTHOUGH YOU COULD ARGUE THAT HUAC WAS A POLITICAL EXTENSION OF THE PRODUCTION CODE. ANYWAY, RAY HAD BEEN A COMMUNIST, HE HAD TO PROVE HIMSELF A STUDIO ROLE PLAYER TO AVOID BLACKLISTING, HE EVENTUALLY COOPERATED WITH HUAC BEHIND CLOSED DOORS. BOGART HIMSELF HAD DENOUNCED THE HOLLYWOOD NINETEEN AND TEN, AND HAD TO MAKE FILMS TO CLEAR HIMSELF OF ANY LEFT-LIBERAL TAINT. “KNOCK ON ANY DOOR” WAS A HARD-HITTING, SOCIAL-CONSCIOUSNESS NOVEL THAT THEY COLLABORATED ON VULGARIZING. IT WAS COMMERCIALLY SUCCESSFUL ENOUGH BUT A SELL-OUT IN OTHER WAYS. BOTH OF THEM REALIZED AND ACCEPTED THIS AS THE PRICE OF SURVIVAL. I THINK THIS FILM – AND SOME OTHERS RAY MADE DURING THE EARLY BLACKLISTING PERIOD – WERE JOBS OF WORK HE DID TO PRESERVE HIS CAREER AND HOLLYWOOD LIFESTYLE. With “In a Lonely Place,” his fourth film, and his second with Bogart, Ray seemed to be more interested in the material than he was with his previous two films. Bogart’s character, Dix, can be seen as one of the many surrogate characters in his films Ray would identify with or share some of the same characteristics with. Today, the film is considered one of his masterpieces. I TRY NOT TO RANK FILMS OR FILMMAKERS OR CALL TOO MANY FILMS ‘MASTERPIECES’, ALTHOUGH I TRY TO RESPECT THE OPINION OF OTHERS. AGAIN, THE STORY OF “IN A LONELY PLACE” CAME FROM A VERY GOOD, UNUSUAL NOVEL THAT WAS FUNDAMENTALLY CHANGED IN ORDER TO CONFORM TO BOGART’S INTERESTS AND THE PRODUCTION CODE. RAY LEFT MUCH OF THE WRITING TO OTHERS. BOGART AND HIS PARTNER, WRITER-PRODUCER ROBERT LORD, WERE REALLY IN CHARGE OF MAJOR PRODUCTION DECISIONS. HOWEVER, ONCE GLORIA GRAHAME WAS CAST, AT RAY’S URGING, THE FILM BECAME MORE PERSONAL, AND THE LAST THIRD OF THE FILM IN PARTICULAR BECAME CHARGED WITH RAY’S INTENSE CAMERAWORK, STAGING, AND SCRIPT TOUCHES. THE CLIMAX IN PARTICULAR CHANGED FROM THE APPROVED SCRIPT AFTER RAY MOVED OUT OF THE HOUSE HE SHARED WITH GRAHAME, THEN HIS WIFE AND THE MOTHER OF HIS INFANT SON. LIVING ON THE SET AT NIGHT, RAY REWORKED THE ENDING AND OTHER SCENES. SO THERE ARE PARTS OF THE FILM THAT RAY DOMINATED WITH HIS VISION, AND THESE, ONE MIGHT ARGUE, ARE THE BEST PARTS OF THE FILM, WHICH MANY PEOPLE DO LOVE. I MYSELF FIND THE CONTORTIONS THE SHIFTING SCRIPT PUTS GRAHAME’S CHARACTER THROUGH – FROM FEMME FATALE TO ADORING TYPIST OF BOGART’S SCRIPT TO CRINGING VICTIM – A LITTLE MUCH. “On Dangerous Ground” is another film I admire. One of the more intriguing aspects in reading the book was a concept Ray had about filming the early city portion of the film in black and a white and the country portion in color. This idea was apparently squashed by the heads at RKO. We also again have a main character (Robert Ryan’s cop) that falls squarely into Ray’s band of outsiders he favored. RAY HAD MORE TO DO WITH THIS FILM THAN MOST OF HIS RKO PROJECTS, OR EVEN THOSE WITH BOGART. HE PICKED THE NOVEL, CHAMPIONED IT TO RKO, GOT JOHN HOUSEMAN CRUCIALLY INVOLVED AS PRODUCER, AND WORKED CLOSELY WITH THE SCREENWRITER TO DEVELOP THE ADAPTATION, WHICH CHANGED THE BOOK FROM AN ENGLISH COUNTRYSIDE SUSPENSE TO AN AMERICAN NOIR WITH A SPLIT CITY-COUNTRY PERSONALITY. THE IDEA OF SPLITTING THE CITY AND COUNTRY SECTIONS INTO BLACK-AND-WHITE AND COLOR INTRIGUED RKO BRIEFLY. RAY DIDN’T HAVE THE POWER TO MAKE THAT HAPPEN. 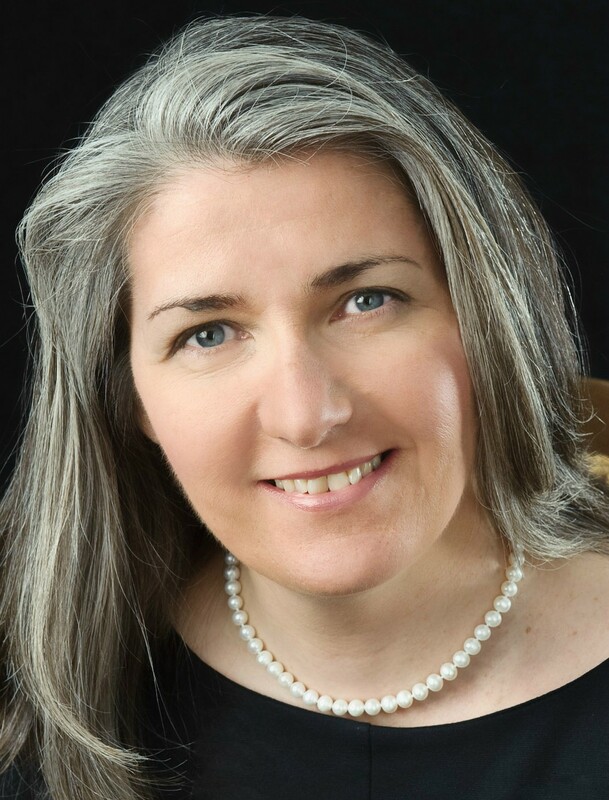 THE WRITER A.I. 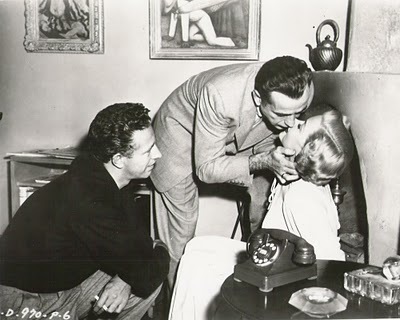 BEZZERIDES SAID THAT RAY WAS REFLECTED IN BOTH THE MAJOR CHARACTERS – RYAN’S EMBITTERED COP AND LUPINO’S STOIC BLIND WOMAN – AND THE CLOSER RAY WAS TO THE CHARACTERS OR ACTORS, THE BETTER THE ROLES AND PERFORMANCES USUALLY. (RYAN WAS ONE OF THE FEW MAJOR ACTORS RAY WORKED WITH MORE THAN ONCE; THEY WERE BUDDIES.) ALSO, THE TEENAGE KILLER WAS PLAYED BY RAY’S NEPHEW SUMNER WILLIAMS, HIS SANCHO PANZA ON LATER FILM PROJECTS. 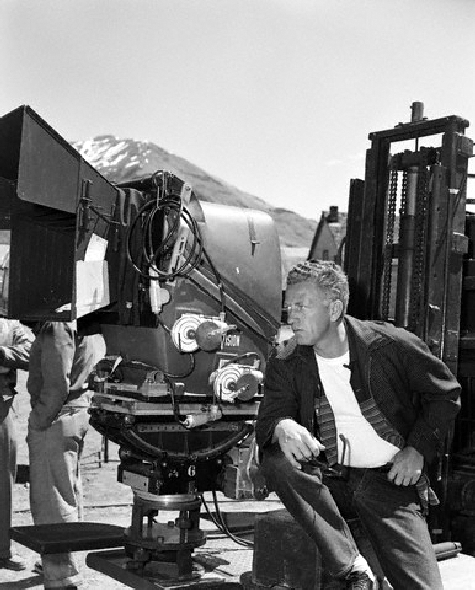 MUCH OF THE FILMING TOOK PLACE IN COLORADO LOCATIONS – WHICH GAVE RAY MORE FREEDOM FROM HOLLYWOOD – AND BECAME ONE OF HIS TRADEMARKS. SO IT WAS A PERSONAL FILM THAT SHOWED HIS QUESTING ARTISTRY, AND CRITICS AT THE TIME RECOGNIZED THAT. One of the oddest films in Ray’s filmography is “Flying Leathernecks,” a red, white and blue tribute assigned to Ray by RKO’s then owner, Howard Hughes. During this time, Ray was feeling pressure to appear before the HUAC and name names. Yet, he somehow managed to both appear before the committee, appease them, and continue on with his career. He never felt the stigma of one who “talked” attached to him like his friend, Kazan. This is one of the most fascinating and mysterious stories about Ray in the book. I DON”T THINK “FLYING LEATHERNECKS” AND SOME OF THE OTHER RKO FILMS (CERTAINLY SOME OF THE ‘SALVAGE JOBS’ RAY DID FOR HOWARD HUGHES) ARE SUCH GREAT MYSTERIES ONCE YOU FACTOR IN HIS SECRET HUAC COOPERATION. IF PEOPLE COOPERATED BY NAMING NAMES – OR, SOMETIMES, GIVING MONEY TO COMMITTEE INVESTIGATORS – THEY USUALLY CONTINUED WORKING. HOWEVER, THEY HAD TO MAKE CERTAIN KINDS OF FILMS FOR A WHILE TO PROVE THEY HAD LEFT THEIR POLITICS BEHIND. KAZAN IS A GOOD EXAMPLE OF THIS; EVEN HE WAS OBLIGED TO MAKE AN ANTI-COMMUNIST POTBOILER AFTER HIS TESTIMONY. I POINT OUT, ALSO, THAT RAY WORKED WITH MANY OTHER FRIENDLY WITNESSES OR ANTI-COMMUNISTS, BOTH BEHIND THE CAMERA (COMPOSER DAVID RAKSIN, WRITER BUDD SCHULBERG) AND IN FRONT (ACTORS LIKE WARD BOND, ROBERT TAYLOR AND LEE J. COBB) – PEOPLE WHO WOULD HAVE BEEN ANATHEMA TO ICTIMS OF THE BLACKLIST. SO RAY WAS ALLOWED TO CONTINUE TO MAKE STUDIO FILMS, BUT AT THE SAME TIME HIS FREEDOM TO MAKE THE KINDS OF FILMS HE WOULD HAVE PREFERRED TO MAKE WAS AFFECTED. COOPERATING WITH THE BLACKLIST BECAME, IN A SENSE, ANOTHER MEANS OF SELF-DESTRUCTION. ALTHOUGH HE WAS ABLE TO KEEP HIS COOPERATION SECRET, HE (UNLIKE KAZAN) MUST HAVE BEEN BURDENED BY SHAME AND GUILT. In 1951, Ray was divorcing Gloria Grahame, his second wife. His career seemed to be spiraling downward, becoming a Mr. Fix-It for Howard Hughes, working on films like “Jet Pilot,” “Macao,” “His Kind of Woman” and “The Racket.” The one personal film that did come out of this period was “The Lusty Men,” a work thematically right for Ray, with Robert Mitchum as an itinerant sensitive loser who comes to learn, you can’t go home again. CLOSENESS WITH ROBERT MITCHUM. RAY NEEDED TO BOND WITH HIS USUALLY MALE STARS, AND WHENEVER HE HAD WHAT I CALL IN THE BOOK A ‘TWO-MAN CLUB’ (RAY AND BOGART, OR MITCHUM, OR JAMES DEAN, OR JAMES MASON TO AN EXTENT) THE FILM WAS ELEVATED. There was plenty of innovative use of the camera by Ray in this film. You write about how he strapped a 16mm camera on to a bronco rider giving us a view of what it’s like to ride a wild horse. There are plenty of other instances of his unique use of the camera which I fine to be one of his most poetic. THE FILM HAD A POETIC CAMERAMAN, REMEMBER, IN LEE GARMES, AND RAY WAS ALWAYS SHREWD ABOUT PICKING HIS CAMERAMEN. RAY WAS FEARLESS IN TERMS OF HIS VISUAL DESIGN AND BORED BY THE STANDARD ESTABLISHING SHOT, TWO-SHOT, CLOSE-UP KIND OF COVERAGE. THERE ARE MANY EXAMPLES – THE HELICOPTER SHOTS AT THE BEGINNING OF “THEY LIVE BY NIGHT,” THE CAMERA STRAPPED ON BRONCS IN “THE LUSTY MEN,” THE TILTED SHOTS AND EXTREME ANGLES OF “REBEL WITHOUT A CAUSE.” WHEN RAY IDENTIFIED WITH THE MATERIAL, HIS VISION WAS PARTICULARLY INTENSE AND YOU SEE THIS IN CODED COLOR SCHEMES AS WELL AS UNUSUAL CAMERAWORK. 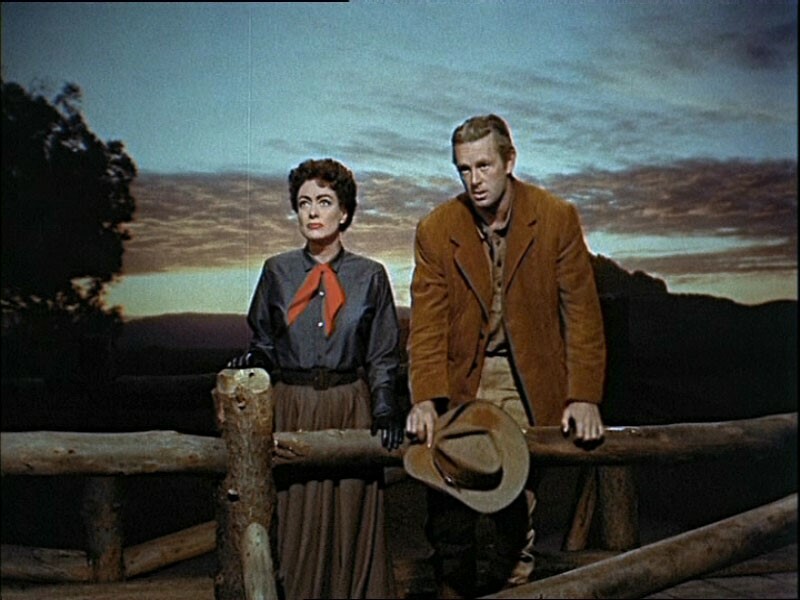 “Johnny Guitar” is a film that really must have stood out at the time of its release. Allegorical westerns were far and few between. The symbolism, the characters, the use of color are all striking as is the gender bending and sexual tension. One has to wonder if the Italian westerns that came to popularity in the 1960’s were influenced by this film and in turn influenced Clint Eastwood’s self directed westerns. I’M NOT SURE THERE IS MUCH OF A CONNECTION, OTHER THAN THE FACT THAT BOTH “JOHNNY GUITAR” AND THE SPAGHETTI WESTERNS ARE PLAYFUL RE-INVENTIONS OF THE GENRE. 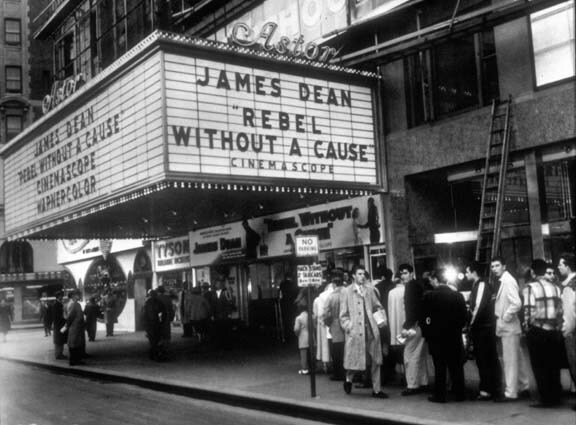 With “Rebel Without a Cause,” Ray continued to experiment with color and the new wide screen Cinemascope format, but the most important factor was the working relationship between Ray and James Dean. You write about how Ray gave Dean a lot of room to improvise during the filming and almost “direct” his own performance. MUCH HAS BEEN WRITTEN ABOUT “REBEL” AND THE INTIMACY BETWEEN RAY AND DEAN THAT CEMENTED THE ENDURING QUALITY OF THE FILM. THE ROLE WAS METICULOUSLY CRAFTED FOR DEAN BY RAY AND THE SCREENWRITER STEWART STERN (WHO WAS ALSO CLOSE TO DEAN), AND AT EVERY STAGE OF THE PRODUCTION RAY EITHER DEFERRED TO DEAN OR BROUGHT HIM INTO THE CREATIVE PROCESS. SOME PEOPLE THOUGHT DEAN WAS VIRTUALLY A ‘CO-DIRECTOR’ OF THE FILM, BUT IN RETROSPECT IT WAS OBVIOUSLY RAY’S MOST BRILLIANT DIRECTION OF A COMPLICATED ACTOR, A STRATEGY THAT HELPED TO MERGE DEAN’S ROLE WITH HIS PERSONA. RAY WAS SELF-DESTRUCTIVE IN MANY WAYS, BUT HE ALSO HAD TRAGEDIES AND CATASTROPHES VISITED UPON HIM – HIS FATHER’S DEATH, GLORIA GRAHAME’S AFFAIR WITH HIS TEENAGE SON, THE HOUNDING BY HUAC, AND FINALLY, A HEAVY BLOW, THE DEATH OF DEAN. THEY WERE GENUINELY CLOSE AND PLANNED MANY FUTURE PROJECTS TOGETHER. RAY NEVER QUITE GOT OVER DEAN’S DEATH. FOR A WHILE HE SEARCHED FOR “A NEW JAMES DEAN,” AS YOU SAY, AND YOU COULD ARGUE THAT EVEN JEFFREY HUNTER AS JESUS IN “KING OF KINGS” WAS A SORT OF JAMES DEAN SURROGATE. DEAN’S DEATH LEFT AN ABSENCE, A VOID, THAT COULD NEVER BE OVERCOME. Today, “Bigger than Life” is considered a near masterpiece by many and again contains one of his most consistent themes that of the Father/son relationship. To me, the film was like an attack on the white picket fence complacency of Eisenhower America. At the time of its release the film did mediocre business and Ray, correctly so, had problems with the ending that was forced on him. “BIGGER THAN LIFE” DID OKAY BUSINESS CONSIDERING, AND IT DREW SOME OF THE BEST REVIEWS OF RAY’S CAREER, IN THE U.S. AS WELL AS OVERSEAS. THE ENDING WAS RAY’S OWN. TRUE, HE WASN’T COMPLETELY HAPPY WITH IT, BUT HE AND CLIFFORD ODETS DEVISED THE FINAL SCENE AS THE BEST POSSIBLE ENDING FOR A DIFFICULT STORY. THE ORIGINAL WRITERS CYRIL HUME AND RICHARD MAIBAUM DESERVE A LOT OF CREDIT FOR ADAPTING THE ORIGINAL “NEW YORKER” ARTICLE, BUT RAY AGAIN TURNED THEIR SCRIPT INTO SOMETHING PERSONAL. HE HAD HIS LAST KINSHIP WITH A STAR – JAMES MASON – WHO WAS ALSO THE SYMPATHETIC PRODUCER OF “BIGGER THAN LIFE.” I KNOW THAT MOST CRITICS SEE THE FILM AS AN ATTACK ON WHITE-PICKET-FENCE AMERICA, BUT I SEE IT ALSO AS A LAMENT FOR THE IDEALIZED FAMILY RAY NEVER HAD. “Wind Across the Everglades” was the first film Ray was fired from. Alcohol and drug use seem to have caught up with him. It also seemed to be the beginning of am erratic period in his career filled with missed opportunities, personal demons and derailed projects, yet in many of the remaining films there are still visual touches of his best work and personal style. I also like the fact that here was a film that dealt with conservation and ecological concerns at a time when it was not of our mindset. AS FINE SCENES THAT MANY ATTRIBUTE TO THE DIRECTOR. 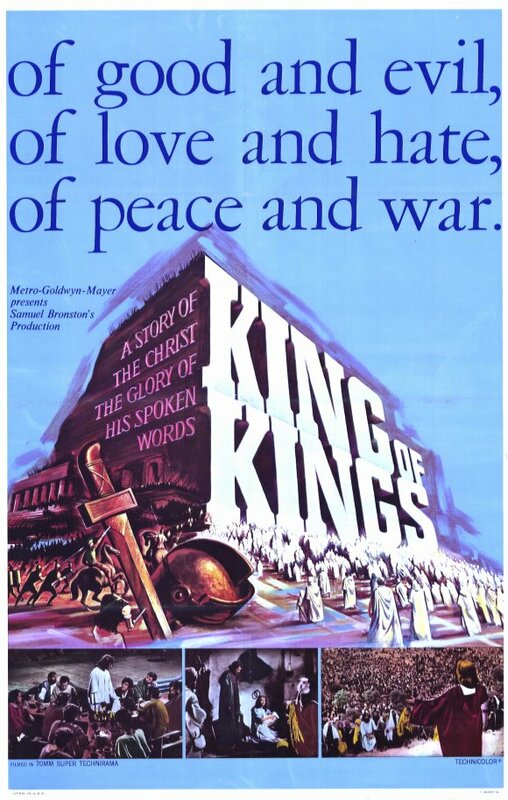 The two Samuel Bronston epics, “King of Kings” and “55 Days at Peking” were contrary to everything Ray artistically seemed to want to make, the small personal film, the anti-DeMille extravaganza and yet here he was remaking ‘King of Kings.” I believe they were both financially successful, yet they also were the final nails in his Hollywood coffin. Did he burn too many bridges? I DON’T THINK OF IT AS EXPLOITATION, OR AS RAY’S “FINAL CUT,” BUT AS WIM WENDER’S DESPERATE, HONORABLE ATTEMPT TO COMMEMORATE RAY WITH ONE LAST WORTHWHILE FILM. Ray’s legacy has continued to grow over the many years since his death and happily you end the book with the announcement that a definitive version of “We Can’t Go Home Again” will be unveiled at the 2011 Venice Film Festival in August which is also the centennial of his birth. Can you tell us a bit how this came about? August 7th is the centennial anniversary of Nick Ray’s birth. This entry was posted in Interview, Nicholas Ray and tagged Interview, Nicholas Ray, Nicholas Ray-The Glorious Failure of an American Director, Patrick McGilligan. An exceptionally probing interview, John, which I eagerly read and learned much from. McGilligan’s Hitchcock book was a terrific balance to Donald Spoto’s biography which almost at times veered into hysteria concerning sexual matters. You’ve done a service to those of us who think of ourselves as film aficionados. I’ve not seen too many Ray films, but “On Dangerous Ground,” seldom seen since its release but, thankfully, featured on Turner Classics, deserves, I think, some very close critical examination because of its sense of loneliness and isolation and an almost ghostly atmosphere of existential… what?… fear? Dread? Thanks again for doing so much to bring attention to what is surely an excellent book and to a fascinating film artist. Thanks Dave for the kind words. 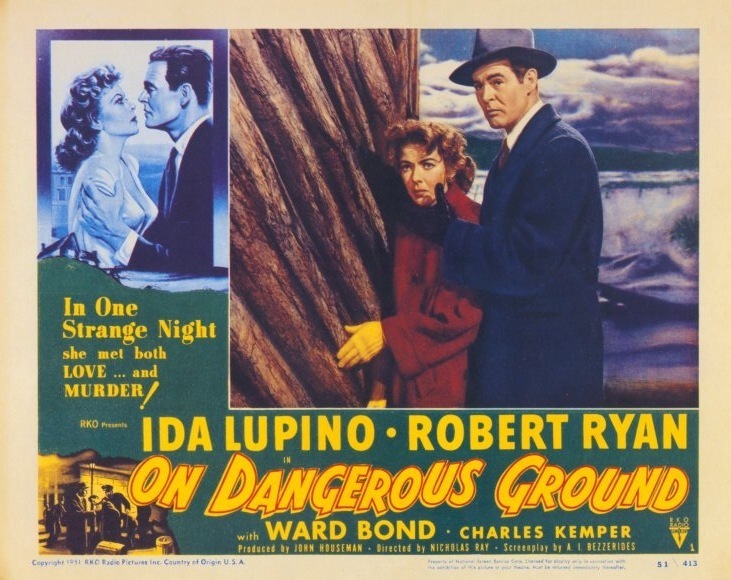 ON DANGEROUS GROUND is one of Ray’s best works, If you have not seen them, I recommend THEY LIVE BY NIGHT, THE LUSTY MEN, IN A LONELY PALCE< JOHNNY GUITAR and of course, REBEL WITHOUT A CAUSE. And i agree with what you say about the difference between McGilligan's book on Hitchcock and Spoto's. John, a stupendous job here! The responses by McGilligan are wonderful and insightful, but your questions are so precisely framed and cover so much of Ray’s career (and also show your obviously great familiarity with his films and admiration of them) that they are just as big a part of this interview as the answers. An exemplary interview, one of great substance and concision. Thank you R.D. The book is a informative and discerning work which I throughly enjoyed reading. I really appreciate the kind words. Fascinating interview, John (for your questions as much as McGilligan’s responses). I’ve read comparisons of JOHNNY GUITAR and ONCE UPON A TIME IN THE WEST in books such as SPAGHETTI WESTERNS: COWBOYS AND EUROPEANS FROM KARL MAY TO SERGIO LEONE. It was interesting to read about the freedom that Ray had on his first film; reminded me very much of Welles’ similar experience with the making of CIIZEN KANE. THEY LIVE BY NIGHT still stands out as one of the great filmmaking debuts! John, your in-depth interview with author Patrick McGilligan about his book “Nicholas Ray: The Glorious Failure of an American Director” was truly absorbing, leaving me with much food for thought about this talented but troubled maverick. Among other things, good point about HUAC being a political extension of the Production Code. I wonder if there have ever been any maverick filmmakers who were NOT intense and driven? 🙂 But seriously, great post! Thanks Dorian, i really enjoyed doing the interview. And the book is an informative read. Thanks again! I was fascinated to read about the original plan to film ON DANGEROUS GROUND in color for the country sequences, an intriguing plan that in the end was squashed by the bosses at RKO. Similarly, while I did know this, it is worthwhile to broach the influence Dean had on ray and how the director ceaselesslyu tried to find an actor to replace him. So many of these pointed questions on the films result in enriching responses, shedding further light on an American icon. Very comprehensive too, as you even went as far as to discuss the Samuel Bronston epics! I will definitely obtain the book, and I congratulate you both! Sam, thanks much. Being a Ray fan, I know you will get much joy and information from reading this book. I also remember your previous phrase for ON DANGEROUS GROUND and other Ray works. I just read today that in October TCM will be celebrating Ray’s 100th birthday with a retrospective of his work including some rarer films like WIND ACROSS THE EVERGLADES. Fascinating interview, John – I enjoyed McGilligan’s book on James Cagney, ‘Cagney: The Actor as Auteur’ and would like to read more of his work. Ray is a director I need to see more of, but I’ve really enjoyed the films of his I’ve seen so far, especially ‘Johnny Guitar’ and ‘In a Lonely Place’. I also like the Western he made starring Cagney, ‘Run For Cover’, which features a Dean-style performance from a young John Derek. Thanks Judy. – REBEL WITHOUT A CAUSE, THEY LIVE BY NIGHT, THE LUSTY MEN and ON DANGEROUS GROUND are must if you have nto seen them. Nicholas Ray and Susan Schwartz were not legally married. You can look it up in the public records. Thanks Tom!!! Sorry for the delay in posting.